This week’s song owes its success, but only in America, to one half of a legendary duo and one quarter of an even more legendary quartet. 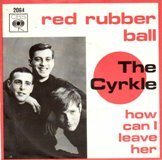 Despite charting half a dozen US hits in just 16 months, The Cyrkle are only remembered for their debut which was called Red Rubber Ball. Rhythm guitarist singer Don Dannemann and singer, lead guitar and bass player Tom Dawes met in 1961 whilst studying at Lafayette College in Pennsylvania and originally formed a band with drummer Mary Fried called The Rhondells. Dawes said, “We did all the pop tunes of the day including songs by the Beach Boys and the Four Seasons.” It was after a performance at Atlantic City in New Jersey that led them to signing a recording contract with Columbia records. The area where Lafayette College is situated in downtown Easton is known locally as the circle. According to the sleeve notes on their anthology, Red Rubber Ball : The Best of the Cyrkle, Dawes said, “Nat Weiss (an artist lawyer) had spoken to Brian Epstein (whom he had been friends for a while) and supposedly asked John Lennon if he had any ideas for group names and, as an allusion to the college area, he came up with The Cyrkle. The newly named Cyrkle got their big break in early 1966 when they opened for Simon and Garfunkel for whom Dawes was also a touring member. During that time Paul Simon offered them Red Rubber Ball, a song he had co-written with Bruce Woodley of The Seekers. After the duo had released the album Wednesday Morning, 3 A.M. which failed in America, Simon moved to the UK where he met Woodley and the pair wrote the song which was originally intended for The Seekers, but the rest of the band didn’t like it and turned it down. After learning that it was a hit for The Cyrkle, the Seekers eventually did record it and can be found on their 1966 album Come the Day which was titled Georgy Girl in the States. Later that year, because of the Brian Epstein connection, they opened 14 nights on the Beatles’ US tour. Paul Simon has stated in numerous interviews that he wrote Red Rubber Ball whilst in England and did so just to get a £100 advance from the Seekers. The Cyrkle’s version, which features an electric organ played by Earl Pickens, was the first production by John Simon who later went on to work with The Band. What set it apart from other tracks of the era was that it was recorded in stereo with lead, bass guitar and percussion on the right track and acoustic guitar and electric organ on left. The vocals were on both. The Cyrkle had one other top 20 US hit, Turn Down Day, but following the death of Brian Epstein the band broke up with Dannemann and Dawes becoming successful jingle writers. Dawes’ most famous TV advert was for the ‘plop plop fizz fizz’ jingle for Alka-Seltzer. Dannemann’s most popular material was for Continental Airlines and Swanson Foods, eventually writing the original 7Up – Uncola ads which featured Geoffrey Holder. The song, which not only famously featured on Leonard Cohen’s jukebox, has been covered by Del Shannon, Mel Torme, Cliff Richard, Cilla Black and Neil Diamond. Once upon a time there were two kids who met in high school, later in life they formed a duo, had one modest American hit and then went their separate ways and had successful careers in their own right. Let’s find out about that one song and the people behind it. 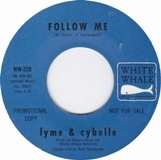 The label credit on this week’s suggestion is given as Lyme & Cybelle which gives nothing away. The single was only issued in the US, Canada and Australia and bizarrely, in America, the label credited their names in lower case letters apparently in an effort to be trendy like a couple of poets once did, but in Oz and Canada they were correctly given capital letters. So, Cybelle was the name chosen by Violet Santangelo which was inspired by the 1962 French film Sundays and Cybelle and Lyme is first musical outing for Warren Zevon who originally began using the non de plume Stephen Lyme before he was famous. Zevon was born in Chicago in 1947 and, although didn’t have any UK hit singles, he’ll always be best remembered for the radio favourite Werewolves of London which featured Fleetwood Mac members John McVie on bass and Mick Fleetwood on drums. Violet said, “I was born in Chicago and later moved to the Land of Lost Angels and attended Hollywood High School, where I met Warren Zevon.” The pair, who were never romantically linked, both shared a love of the Beatles and began singing songs together. At a gig one day the American child actor, Michael Burns who appeared in the TV series’ Lassie and Bonanza among others told his mother about the duo he’d seen. She worked at White Whale Records which led them to sign a recording contract with them. They recorded three songs with the label, the self-penned Follow Me was the first, a cover of Bob Dylan’s If You Gotta Go, Go Now and their final one was Write If You Get Work. Follow Me was written by both Zevon and Santangelo and because of its sound it is generally accepted as being one of the earliest psychedelic songs. It has beautiful harmonies reminiscent of the Mamas and the Papas and a catchy hook, but it only peaked at number 65 in America. One of the reasons for its low placing was, as Santangelo recalled, “The single began selling well, only to have its momentum crushed when Bill Gavin, a powerful radio industry figure, claimed the song was sexually suggestive.” Listening intently and scanning the words carefully one wonders what planet the people who make these decisions are on. Not one word, even for the sixties, can remotely suggest anything suggestive. It’s the epitome of a flower power anthem all culminating with a brilliant production by Bones Howe who is best remembered for his production work with Fifth Dimension and The Association, both revered harmony groups, as well as The Monkees and Alessi’s 1977 hit Oh Lori. Zevon, who was writing a number of songs, began presenting them to White Whale label mates The Turtles. Outside Chance, which was co-written with Santangelo, was one such track, but it didn’t chart even though it had more than a passing resemblance to the Beatles’ Taxman. Incidentally, the B-side of Follow Me was called Like the Seasons and appeared on the B-side of The Turtles American pressing of Happy Together but in the UK it was relegated to the flip side of the non-hit Can I Get to Know You Better. Her musical highlight must have been performing as Lyme & Cybelle in a club on the Sunset Strip with Van Morrison as their opening act. Songs written about a loved one is always going to be personal to the person who wrote it or to anyone in a similar situation who can relate to it. The same must apply to songs written about pets because pet owners will usually get very attached to it, but, oddly, this week’s choice is a song written about someone else’s pet. 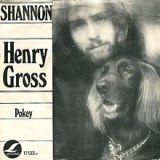 Henry Gross was a one hit wonder in the UK, his only hit was called Shannon. He grew up in Brooklyn, New York and because his mother loved music, she encouraged her son to become a musician. He learned to play a number of instruments including the guitar, ukulele and sitar and by the time he was 14 he began playing in small clubs around the New York area. In 1969, when he was 18, he became a political science and speech major at Brooklyn College and was a member of a band called Orogeny which is the technical name for a formation of mountains. Whilst there he and a couple of school mates had the idea to form a fifties revival band which they called Sha Na Na. The same year they played at Woodstock and in doing so Gross became the youngest person to play the main stage. In 1970, he decided to depart for a solo career. He recorded the track onto a cassette and sent it to Carl Wilson hoping the Beach Boys would record it. It even had the falsetto sound the Beach Boys could produce. “I never heard from anyone about it, so I recorded it myself and put it on my album,” Gross recalled. In the mid-eights Gross moved to Nashville and continued songwriting and recording. He formed his own Zelda Record label and released the album Nothing but Dreams. In 2006 he recorded an album called One Hit Wanderer which is also the name of his one-man show which he still performs around the States. In 2016, Joe Brown began a UK tour an invited Gross, his long-term friend over to share the stage where they perform songs from both of their repertoires. It was a great success and in January 2018, the pair took to the road again for three months and this time it was recorded for a live album. If Scott McKenzie’s San Francisco (Be Sure To Wear some Flowers In Your Hair) and Procol Harum’s A Whiter Shade of Pale shaped the Summer of Love in the UK in 1967, almost certainly Somebody to Love by Jefferson Airplane did the same across the pond. It might just have been the right time for that song because it failed first time round. The song, which for a certain generation, will always be associated with the American psychedelic rock band Jefferson Airplane, never made the UK chart so for another generation it will be best remembered by the Boogie Pimps who took a dance version to number three in 2004. Jefferson Airplane were formed in 1965 in San Francisco and originally comprised singer and rhythm guitarist Paul Kantner, bass player Marty Balin, lead guitarist Jorma Kaukonen, singer Signe Anderson, double bass player Bob Harvey and drummer Jerry Peloquin. Within a few months Peloquin was replaced by Skip Spence and Harvey left. Arguably the most famous female voice of Jefferson Airplane was Grace Slick who joined the following year to replace Anderson who left to have a baby. 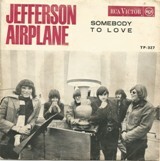 Their debut album, Jefferson Airplane Takes Off in 1966 did the exact opposite, it failed to trouble the UK & US chart, the follow-up, Surrealistic Pillow, now with Slick at the helm had a cult following and, like the single, never troubled the UK chart, but did reach number three in the States. It also contained the Slick-penned track White Rabbit also written and first recorded by the Great Society after Slick had read Lewis Carroll’s book Alice in Wonderland. In 1996, Jim Carrey performed a version in the film The Cable Guy in which he starred. The Airplane recorded five further albums over the following five years, After Bathing at Baxter’s (1967), Crown of Creation (1968), Volunteers (1969), Bark (1971) & Long John Silver (1972) but by now Balin had left the group and other members were embarking on their own solo projects. Some remained friends and continued touring and they decided in 1974 to continue under the name Jefferson Starship with Balin returning. Balin left again in 1978 and was replaced by Mickey Thomas and the following year Slick departed for a solo career. In 1980 they had a UK hit with Jane and recorded eight albums under that moniker. In 1984, Kantner, the last remaining original member left and then filed a lawsuit over the use of the name. Kantner settled out of court and an agreement was signed that no one left in the group could use the name Airplane nor Starship, so they became just Starship and had their biggest UK success with We Built This City in 1985 and the chart-topping Nothing’s Gonna Stop Us Now, written by Albert Hammond, two years later. At the time it was announced that Slick, then aged 47, became the oldest female to appear on a number one hit however researchers at the time hadn’t considered Hilda Woodward, the piano-playing mum with Lieutenant Pigeon who was 59 when Mouldy Old Dough went to number one in 1972. After all that, in 1989, with the original 1966-70 line-up (except Dryden), reunited for a tour but he did join them in 1996 when they were inducted into the Rock and Roll Hall of Fame where they performed as well, but Slick was not present apparently due to medical reasons. In 2006, Richard Branson launched Virgin America Airlines and named their first aeroplane Jefferson Airplane. Slick was present at the time and gave a speech. The same year she had health issues suffering from diverticulitis and also required a tracheotomy. She was put into an induced coma for two months but then had to learn to walk again. Not many of the original line up are still about; Spencer Dryden died of colon cancer in 2005 and both Anderson and Kantner died on the same day – 28th January 2016. In America, only one song by the same artists has reached the top spot twice in separate chart runs, that was Chubby Checker’s The Twist which did so in 1960 and 1962. In the UK, the same feat has happened twice, firstly in 1991 when Bohemian Rhapsody topped the chart 16 years after it was first there and that was following Freddie Mercury’s death. The second time was in 2002 when George Harrison’s My Sweet Lord returned to the top spot exactly 31 years after its original run and that was following George’s death. Only last week have we had a song return to number one for a third time. Pages of misheard lyrics are rife on the internet, but many of the examples look too contrived to have evolved naturally. In 1985 Prince had a hit with Raspberry Beret and one of the lines was ‘Thunder drowns out what the lightning sees’ the Liverpool musician Ian Broudie heard it as ‘Thunder drowns out what the lighting seeds’ and that became their name. They were the most successful Merseyside band of the nineties. This was largely due to Ian’s melodic songwriting and strong vocals, but the contributions at different times of guitarist Paul Hemmings, bass player Martyn Campbell and keyboard player Angie Pollock should not be overlooked. Chris Sharrock was the group’s first drummer and for a time they also had Ringo Starr’s son, Zak Starkey, in the band too. Between 1989 and 1996 they charted eight UK singles but none had made it into the top 10. When they were asked to make a record for Euro 1996, Ian Broudie was not sure, “I would never have bought a football single myself and I certainly didn’t want to do one of those cheer-leader records. Being a fan is being about losing and, if we did it, I wanted to write it from a fan’s point of view.” He asked the football-obsessed comedians, Frank Skinner and David Baddiel, to sing on the record and help with the words. 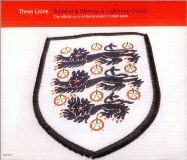 Three Lions was the first football single which suggested that the team might not win and was therefore more realistic. It turned out to be correct as England lost to Germany in a penalty shoot-out in the semi-final. The reason for the title is that the Lion has been a symbol of England since the 11th century and it was featured on early versions of the English Coat of Arms. English medieval warrior rulers had a reputation for bravery and the most notable was Richard I who was known as Richard the Lionheart. After he died in 1199, the arms on the second Great Seal of Richard I was used by his successors until 1340 and depicted three golden lions on a red field, representing the ruler of the Kingdom of England, Duchy of Normandy and the Duchy of Aquitaine. Between 1154 and 1189 the crest was a single vertical lion facing left, from 1189 – 1198 there was two vertical lions facing each other and 1198 – 1340 there were three horizontal lions facing left but looking forward. Lightning Seeds disbanded in 2000, and although a reunion tour has been mooted, it grows less likely as Ian Broudie has been producing hit singles and albums by The Coral and The Zutons. At the 2018 World Cup in Russia England got further than expected. By the time of the semi-final, it was no longer a World Cup, just European as the only teams left were England, France, Croatia and Belgium. At this point the football anthems began to make the UK chart again. 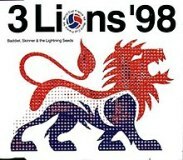 The week England made it to the quarter finals Three Lions re-entered the chart at number 72, but as it was all down to streaming and downloading the version that entered the chart was just billed as Three Lions because it was an amalgamation of the 96 and 98 versions. The following week it climbed to number 42 and once we’d made it to the semi-final it sprang up to number 24. The week we were due to play the semi-final the midweek sales flashes had the song at number one. When England lost to Croatia the streaming dropped off but it had done sufficiently well earlier in the week to remain at number one when the chart was revealed on Friday 13th July – not unlucky as it became the first song to top the chart three times. Even the chart-topping predecessor, George Ezra, selflessly encouraged fans to buy Three Lions. That week’s ‘sales’ of Three Lions was 79,999 which was made up of 43,369 in paid-for downloads and 36,410 streams. It took the single’s total sales to date to 1,078,421. In this day and age you need to be a mathematician to understand the chart rules implemented by the Official Chart Company. The rules state that an act with a lead credit can only have a maximum of three tracks in the chart, this followed the Ed Sheeran debacle where every track from his Divide album went into the top 20. Other rules state that if a track has had three consecutive weeks of sales decline then ACR (accelerated chart ratios) kicks in, which means that a sale to stream ratio will change from 1:100 to 1:200 (in the case of premium streams) or 1:600 to 1:1200 (in the case of ad funded streams). But these rules do not apply until a song has been on the chart for at least 10 weeks. As of 1st July 2018 video streams were taken into account for chart counting. Just to add to any confusion, a new recent tweak of chart rules say that a track only escapes ACR if it is not being actively promoted, Three Lions wasn’t so as chart commentator, Alan Jones, put it, “If Three Lions was being actively promoted, its sales this week would be 116,189 instead of 79,779.” Anyone keeping up with this? Incidentally, the week following the final saw another chart record set when Three Lions dropped from number one to number 97 beating the previous record set by the Lewisham & Greenwich NHS Choir’s rendition of A Bridge Over You which dropped to a mere number 29 in 2016. Tom, a producer on the Radcliffe and Maconie show on BBC6 Music, just before the final, witnessed and was incensed that some French football fans people in a pub were singing ‘Football’s coming home’ but not for England but for themselves. Well, why not, for them it did. Michael Jackson clearly had a very vivid imagination as can be clearly seen in the hit single Smooth Criminal and the story is entirely fictional, but some of the terminology is based on some real phrases which Jacko picked up whilst on a training course. Michael has really always been a star, but after his 1979 album Off The Wall, he was catapulted to a different level and people were queueing up to work with him for what was to become the biggest-selling album of all-time – Thriller. The superstar pairing of Jacko and producer Quincy Jones continued and personnel included on Thriller were Paul McCartney, James Ingram, Janet and LaToya Jackson, David Paich, Jeff Porcaro, Rod Temperton, David Foster, Greg Phillinganes and, of course, Vincent Price. It went on to sell over 40 million copies worldwide, but in 1986 when Jacko began work on the follow-up people did wonder if he could ever emulate its success. In short, yes he did. The result was Bad. The first single was I Just Can’t Stop Loving You, a duet with Siedah Garrett which got to number one, then came the title track which reached number three, The Way you Make Me Feel equally the peak of Bad. The record company continued to milk the album for singles, Man in the Mirror peaked at 21 but then Dirty Diana reached number four, Another Part of Me got to 15 and came Smooth Criminal which was yet another top 10 hit. The song tells the story of a burglar coming in through the window saw the woman sitting at the table, she tried to run and he struck her leaving blood all over the carpet. As the first rescue team arrive they found she wasn’t breathing and were trying to resuscitate her. The memorable refrain throughout the song is the repetitive line ‘Annie, are you OK? Are you OK Annie?’ This would imply that the assaulted woman was called Annie, but not necessarily. According to Spike Lee in his documentary Bad 25 Michael had attended CPR (cardiopulmonary resuscitation) training prior to writing Smooth Criminal and it was this experience which inspired him to write the song. Annie are you OK is the phrase used as one of the first steps when assessing whether to perform CPR on an unconscious casualty. Young medical trainees are taught to use the phrase to determine if the patient is conscious and responsive. The second verse is Michael singing to an unconscious Annie saying, ‘Will you tell us that you’re ok, there’s a sign at the window that he struck you’ but Annie doesn’t seem to respond. 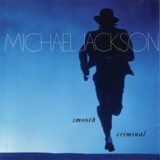 Michael began penning the song in 1984 and originally called it Al Capone and the demo was recorded the following year. This version eventually appeared on Bad 25 in 2012 which was the 25th anniversary of the album. The original track was re-worked with amended lyrics and became the track we know. One of the highlights of Michael Jackson’s music was the wonderfully ground-breaking videos that accompanied them. It was at the Motown 25th Anniversary in 1983 that Michael first revealed his Moonwalk, for the Smooth Criminal video he showcased a gravity-defying forward lean often at 45 degrees which he even performed at live shows. The video, which was originally 42 minutes long, was a section of the Moonwalk film that was directed by Colin Chilvers who had created The Rocky Horror Picture Show and Superman films. Colin explained in an interview with Rolling Stone how it came about, “I showed Michael a movie that I felt would fit the theme of the piece, The Third Man. He loved the look of it, that sort of film-noir look, so we used that to get the camera man to light it in a similar way. The dance piece was a tribute to Fred Astaire and he actually wears a similar kind of costume that Fred had used in one of his movies – Band Wagon. We had the pleasure of having Fred’s choreographer, Hermes Pan, come on the set while we were doing the song and dance piece and said that Fred would have been very happy and proud of being copied by such a wonderful person.” The lean was accomplished with specially designed shoes that were able to lock into an anchor on the floor. The video was co-choreographed by Jeffrey Daniel, a one-time member of Shalamar, who himself showcased his own moonwalk. The dancer in the video was Vince Paterson who Michael used in both Thriller and Beat It. The song opens with a dramatic stab followed by a pumping heartbeat, it’s Jacko’s own heart which had been digitally procssed through a machine known as a Synclavier.